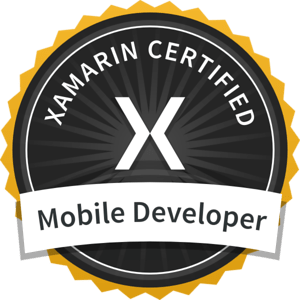 I just received the email notification from Xamarin that I successfully passed their Mobile Developer certification exam. I was given a free pass for the exam for attending the Xamarin Evolve Developer conference back in April. It was a tough exam, it went pretty deep on some of the internals and covered a lot of iOS and Android territory. Passing grade was 50% correct of 100 questions. I hit 90% and the exam software showed me what the correct answers were for what I got wrong. Does it make me a better developer? No, but it shows that I have the knowledge and skill set to create iOS and Android apps using C# with Xamarin technology. More importantly, I am using the skills that I learned at Evolve while I work on a new app for work. I really like how Xamarin had put together the training materials for sessions. Instead of the usual slide deck and sample code that you get a conference training session, Xamarin provided chapters of an training manual that covered each session. Plus the source code. You still get the source code. Yesterday, I went from zero experience with SQLite to being able to create, populate, and use a SQLite database with the sqlite-net ORM code in just a couple of hours. My only reference was the materials from the Evolve session on cross platform data handling. It’s been hugely productive to be able to use C# and the .NET Framework on the mobile side as well as the server side. As a side note, the SQLite Database Browser is great open source tool for checking the contents of a database created in the iPhone/iPad simulator. It’s also useful testing SQL queries before you compile them into your code. Evolve had two parallel training tracks going on at the same time. I was taking the Fundamentals track to make sure that I had the foundation of Xamarin coding down. Now I can review the Advance training materials and move up to the next level.